It's an Etsy day and this week's shop is called Potato Patch and the lucky winner will receive a short sleeve shirt of their choice! Wanna play.....check out the above shop, pick your inspiration, make your creation & link it to Ashley's blog. I know that Father's Day is right around the corner but I was feeling a bit Patriotic when I started on my creation. Surprisingly, I wasn't in the mood for a card so I made a 6x6 scrapbook page that will eventually be turned into a 12x12 layout. I just love that star wheel and those punches....they make life a bit easy don't they?!! I also *dusted* off my scallop edge punch for this page----felt good too LOL! My finishing touch was highlighting my scallops with the gel pen & that's all it *needs* for now. I'm kind of anxious to *finish* the bigger layout now but it will have to wait 'til I'm done with my Convention stuff!! Make sure you check out the rest of the DT to see their awesome creations and be sure to leave them some love! Jackie this little layout is awesome! :) You did such a wonderful job! You have me inspired to make Fourth of July cards! :) Thanks! This is awesome. Great job girl!! What a bright and cheery, fun card! faaaab card, i love it! Love this! Very patriotic! That shirt is TOO cute that you got your inspiration from too! ADORABLE! I love all the stars...can't wait to see the rest of the layout! Love your card and the patriot feel! You hit it dead on! Great job, Jackie! What a great patriotic card!!! That shirt is just adorable too!! Love it! I wasn't going to make anything for Fourth of July, but I really think I have to now. Thanks for the inspiration! That is so cute and fun for the upcoming holiday! What a fun sb page accent piece. I like all the stars you were able to fit in. I love your patriotic card! Have a great weekend! Your card is perfect! I love the dimension all the stars add! This is great. 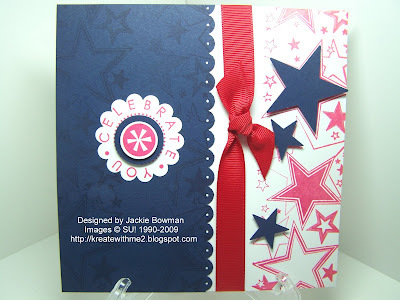 Love how you used your star punch for this and can't go wrong with red, white and blue. Very cute and so festive Jackie! I love it! Fabulous layout. Love all the special touches you added. I love your layout Jackie. I can't wait to see the 12x12 when you're done. 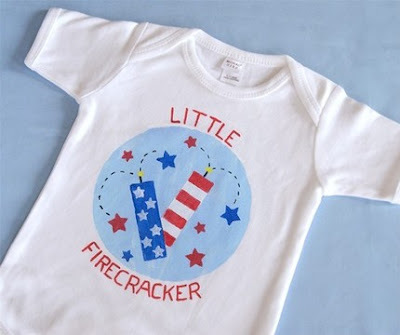 Love your patriotic design! Awesome!! Jackie, I think in the card making world, because we cardmakers have to think ahead, we are on to the next holiday rather quickly. But the 4th isn't all that far away! Especially if you have to mail the card! Love your stars! Gorgeous card! And the sentiment feels good! Great card! Loving all the stars! too too cute!! LOVE THIS! Fabulous take on this challenge. You always inspire me with your creative style. What an awesome take on the inspiration Jackie!! Love your patriotic creation!! this is a wonderful 4th card. Wow Jackie after owning that wheel I know how much work you put into this to get those colors and I love this!!! You really outdid yourself last week and I love the red whites and blues last week!!!! I am going to have to case this card maybe for stampers club some version of it!!! Lovely job and sorry it took me so long to get around after last week!!! !